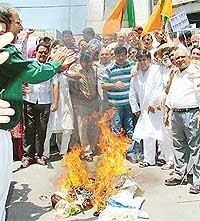 Activists of the BJP, led by the district president of the party, Dr Subhash Verma, today held a demonstration and burnt the effigy of the Chief Minister here in protest against the acute shortage of power and water in the city. Residents of Dad village heaved a sigh of relief today when a bomb disposal squad of the Punjab Armed Police (PAP) Jalandhar defused a live but badly rusted bomb that was found in the village pond about four days ago. 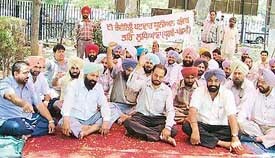 Small saving agents of the Ludhiana division suspended their work indefinitely and held a demonstration at the office of the Senior Superintendent of Post Offices (SSPO) here today against the alleged arbitrary policies of senior officials in respect of payment of their commission and deduction of income tax at source. Five persons accused of attempting to launch a murderous attack on a man for allegedly taking forcible possession of a shop in the Ghumar Mandi were remanded in police custody till June 4 by a local court here today. 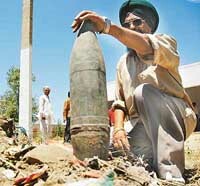 The blast which shook Delhi’s cinema houses had a similarity with the blast which had taken place in Ludhiana in 1995. The local Revenue Patwar Union staged a dharna in front of the local SDMs office in support of their long standing demands. Protesting against the state government’s “privatisation” policies, the Revenue Patwar Union held organised a dharna outside the Deputy Commissioner’s office here today. The Khanna police has arrested two smugglers and recovered 2 kg of opium from their possession on Tuesday. Increasing labour unrest is giving sleepless nights to local industry, which is suffering in terms of loss of production and profit. Dr Malwinder Singh Tiwana, Dean, College of Agriculture, Punjab Agricultural University, Ludhiana , retired yesterday. 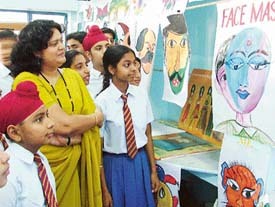 A three-day Scholastic Book Fair concluded at BCM School, Dugri, today. The fair had the collections of around 4,000 books catering to students, teachers and parents. If mathematics has been giving you sleepless nights, you can now relax and get step-by-step guidance on all topics sitting back at home on your PC. 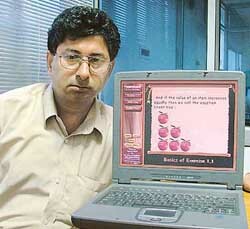 HIM Computers has come out with a maths software for Class X students. The software not just contains solutions along with explanations for all the problems as per CBSE norms but also gives verbal instructions on basics apart from giving a graphical illustration of each and every step that leads to solutions. Akshi Sareen, a student of the Government College for Women, has topped the BCom II examination conducted by Panjab University. She secured 963 marks out of 1150. A six-day summer camp at the Kundan Vidya Mandir School, city branch, G T Road, concluded here yesterday. A large number of students attended this camp during which various classes in drawing, personality development, pottery, mehndi, painting, craft and music were held. Mr K.S Sohal, the incoming District Governor of Lions Club International District 321-F, has appointed a team of Lions Club members to look after the administrative work of District 321-F. Mr Sohal will be leaving for Hong Kong in the third week of June to attend the International Convention of the club where he will take oath as District Governor for the year 2005-06. Mr Sarabjit Singh Dhaliwal today took over as Civil Judge Senior Division, Ludhiana, replacing Mr G.C. Garg who has been transferred to Gurdaspur on promotion as Presiding Officer of the labour court. Listen India Tour 2005 — a musical concert in which four international artistes performed together for one common cause of creating awareness about prevention of AIDS, was held at the GRD Academy grounds here last night. The district health administration today launched its month-long anti-malaria campaign by taking out an awareness rally. The Ludhiana District Cricket Association (LDCA) will conduct trials for under-22 players at Arya College here on June 3 at 4 pm. According to Mr Vinod Chitkara, general secretary, LDCA, the selected probables will undergo training at the same venue prior to their participation in the Punjab State Inter-District Cricket Tournament to be organised by the Punjab Cricket Association at different places from June 11.